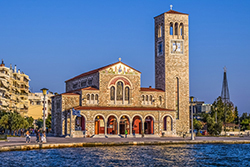 The political capital, the commercial and cultural centre and the main port of the prefecture of Magnesia is the city of Volos, located at the very heart of the peninsula. 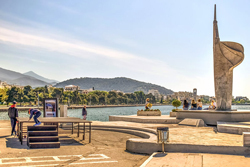 Volos is a lively modern city that can get quite pleasant at the numerous paved streets around the harbour, ideal for walks around the myriads of shops, café-bars, restaurants and among all the famous tsipouradika to offer the local tsipouro with tasty mezes. The city's port links with the Sporades islands and features historical and cultural centres such as museums and galleries. 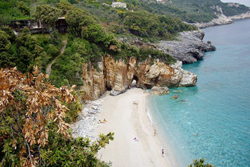 From the foot of the Pagasitic Gulf where Volos is located, spreads the mountain of Pelion, according to mythology the summer resort of the 12 Gods of Olympus and the legendary country of Centaurs. Pelion is an area of exceptional natural beauty to combine, snowy mountains, sandy beaches and traditional villages of unique architecture, all within a few minutes ride. 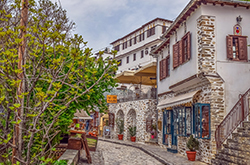 The first traditional hamlets to be found as ascending the mountain of Pelion from Volos are the villages of Portaria and Makrinitsa to amaze every visitor with the unique natural beauty and architecture. Old mansions charmed with wooden carved details, wall paintings, and stone roofs, surrounded by stone paved winding car-free streets with running waters on the sides are all parts of a mosaic to make this destination unforgettable. 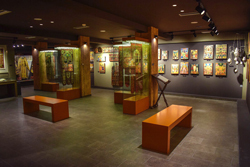 Beautiful historical churches, monasteries and museums are well worth a visit. One of the most touristic villages of Pelion is Tsagarada located in the middle of a chestnut wood forest with large flower garden houses and a huge and imposing one thousand-year-old plane tree located in the middle of a square, along with major churches. Last but not least, Zagora features remains of an ancient castle and a necropolis, along with folkloric museums. The extremely diverse morphology of the Magnesian ground, is the ideal platform for a number of activities to range form diving to skiing. The mountainous village of Hania, houses the Agriolefkes Ski Centre and resort with four fine slopes and eight ski runs ideal for skiers as well as snowboarders, fully equipped with lifts, accommodation, café and parking area. Magnesia is a hikers' paradise, with Pelion being the star of the show, with old mountain trails to connect several villages or several hiking paths across the hills. Another way to explore the natural beauty of the area is the old Little Train of Pelion, a part of history that turned into a tourist attraction following routes between Ano Lehonia all the way to Milies. Caving can also be practiced in Magnesia at the caves of the Centaurus in Agios Lavrentios and the old Migela nearby Horefto. Magnesia also offers for bird watching at the wetland of Sourpi a protected area with willow, pine and plane trees grow around salty marshes as a winter shelter for migratory birds like nightingales and herons, also to be found at Almyros. On the other hand, several birds are to be found at the mountains of Pelion such as several types of buzzards, eagles and woodpeckers between others. The lovers of horse riding can take lessons by the local horseback organization under the supervision of experienced teacher, in order to explore the region in a unique way. Other than the wonderful highlands of Magnesia, the coastline is of equal beauty to be explored with canoes or small boats to be rented from the seaside village of Agii Saranta. Several diving schools organize excursions around the Pagasitic Gulf and the eastern coast to offer unique exploration opportunities as the seabed features clear and calm waters, seals, dolphins and a terrain will shipwrecks, reefs, vertical walls, enchanting sealife and much more to surprise any diver. Finally, as Magnesia is a proud producer of wine, a wine festival is organized annually by the local agricultural association to offer freely the fine local products.